Villa Kismet – where attention to detail and big dreams come together to form a truly unforgettable architectural masterpiece. 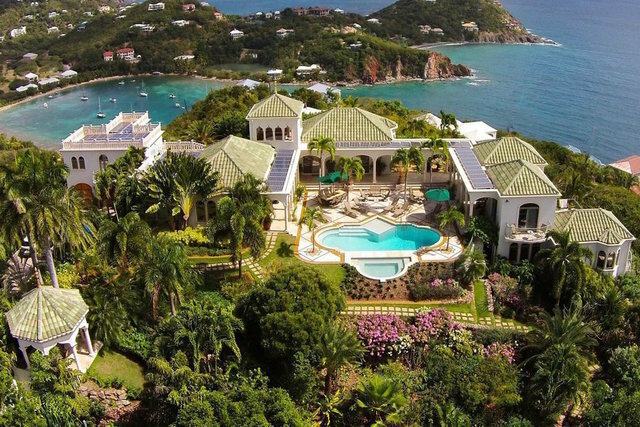 Blessed with a prime knoll top location on the crown jewel of the US Virgin Islands, Villa Kismet stands alone as St John’s premier residential estate. Just minutes away from the full service airport on neighboring St Thomas, Kismet offers easy access from Europe, the Middle East and the Americas to all the charm and natural wonders of this uniquely protected Caribbean island. From its ultra private perch, the villa offers 360-degree views framing miles of open ocean, numerous protected bays, sleepy outlying islands and thousands of acres of verdant hillsides within the vast Virgin Islands National Park. A sprawling compound befitting its one-of-a-kind location, Villa Kismet’s subtle Moroccan undertones are evident throughout the numerous guest suites, common living areas, outdoor spaces, billiards room, home theater and separate caretakers residence. The approach to Kismet winds its way to the summit of Maria Bluff just outside the island’s charming main town of Cruz Bay. Once inside the gated parking court, a custom tiled staircase leads you onto the central courtyard and pool deck revealing the drama of this unique knoll top oasis. Inside, the villa offers an immaculate confluence of the latest in high tech convenience along side old word custom quality finishes including tile work throughout by renowned artist Muhammed Benslimane of Mosaic House New York. Luxury ensuite accommodation for up to sixteen guests is accessed via shaded verandas interconnecting the villa’s three main pavilions offering plenty of refuge from the villa’s more public common spaces. Above it all, an observation tower with plush seating for up to twelve offers the island’s most spectacular vista to take in the world-class sunsets as a pastel of ever changing colors gives way nightly to the quietly twinkling lights of St Thomas in the distance. Offered at $9.75 million USD.